After the successful deployment of the Operating system and the Openstack software, the external networks and the shared flat networks must be allocated by the Openstack admin. –router:external true tells Openstack Neutron, that this is a floating pool. This allows non admin users to attach routers to this network and allows the usage of floating IP addresses. It prohibits the attachment of VMs to this network for non admin tenants. –router:external false (the default setting) tells Openstack Neutron, that this is not a floating pool. VMs may be attached to this network. –no-gateway disables the default route for this subnet. This is necessary, because the gateway for this network is a physical router and the physical router cannot provide a metadata service. By default neutron provides the neutron metadata services on a router created by the L3 agent. The option –no-gateway has the side effect, that a static route to 169.254.0.0/16 is inserted by the DHCP agent when providing the network configuration for VMs. This makes the metadata service available on the flat network via the DHCP agent providing a metadata service in the DHCP network namespace. Now the infrastructure has been deployed. Let’s take a view on the network and compute node. 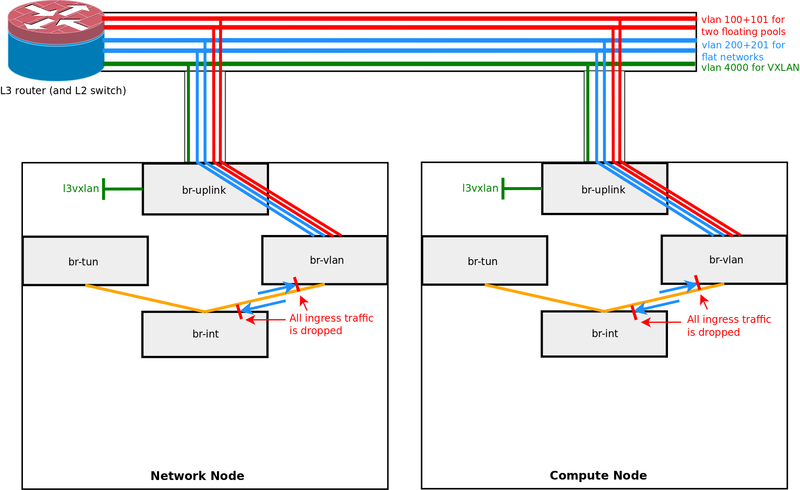 The network configuration on the network and compute node is nearly the same. The bridge br-uplink is not used by Openstack. port 2 is the patch port between br-int and br-vlan (2/none), which is set up by Openstack. So any traffic entering br-vlan on the patch port from br-int is dropped. All other traffic is forwarded like on a switch with MAC learning. What is connected to port 1 on br-int? port 1 is the patch port between br-int and br-vlan (1/none), which is set up by Openstack. So any traffic entering br-int on the patch port from br-vlan is dropped. All other traffic is forwarded like on a switch with MAC learning. The article Openstack Neutron using VXLAN discusses the Openflow rules on br-tun. Openstack Liberty/Juno made a few changes (e.g. other/additional Openflow tables) – but this differs only slightly from Openstack Havana. The article will be updated when Openstack Mitaka has been released.